Alpacasare a South American relative of the camel. Closer relatives include the domesticated llama, and the wild guanaco and vicuna. They stand 81 – 99cm at the shoulder. 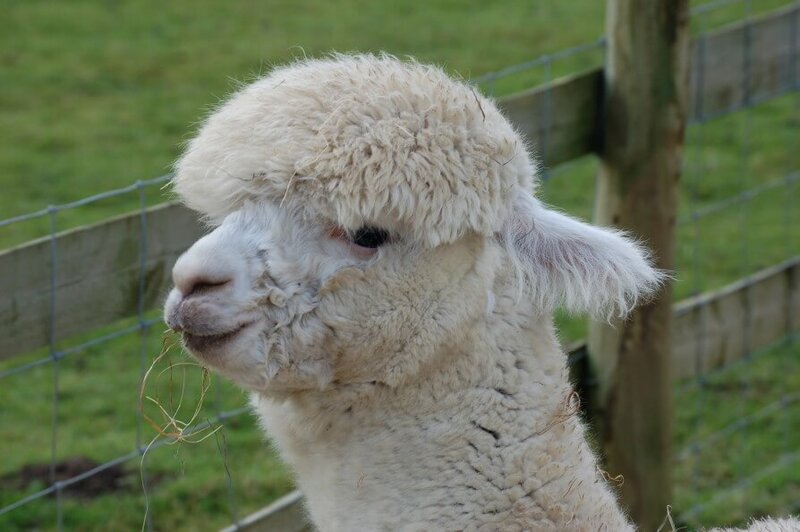 An adult alpaca weighs 45 – 86 kilograms.Alpacas come in a myriad of natural colours: pure white, the most delicate fawns through to grey tones, from the lightest silver to a warm rose grey, and a true jet black. There are 22 recognized alpaca colours but the fleece also has the additional advantage of being readily dyed. Habitat: The natural habitat of the alpaca is the Andes of South America where they live at great height, usually over 4,000 metres. Population: Worldwide the alpaca population is estimated to be 3 million, with the majority in the South American regions of Peru, Chile and Bolivia. Today the alpaca is farmed not only in South America, but also in North America, Canada, Australia, New Zealand and the UK. The North American territories are estimated to have close to 60,000 animals with Australia having a similar number. In the UK current estimates are around 10,000. Lifespan: Alpacas generally live 15 to 20 years. Diet: Alpacas like to graze on grass and browse on weeds, leaves and shrubs and chew the cud like a cow. Behaviour: Alpacas, by nature, are very intelligent, gentle animals and are quick to learn, cooperative, and patient. Like camels, alpacas do spit but usually at each other and mainly over disputes about food. Alpacas produce a humming sound as a means of communication, along with head and ear posturing.